You never know what to expect as a commission, do you? A couple of days ago I had a message from Global Bunny. She's about to go off on a trip to Africa, and needed a blanket. I grabbed my needles and set to work. The bunny blanket was sent off to The Warren and was found to be a perfect fit! her suitcase and is all set to go. I'm looking forward to hearing all about her adventures! Such a cute post! Thank you! Bunny is now with Mr O'Grady and being shown to Year2 today! Off on Monday to Kenya! She's a little nervous though. She loves her blanket and rushed around fitting it into the suitcase. It is indeed a perfect fit. Oh sweet. Awaiting further tales. 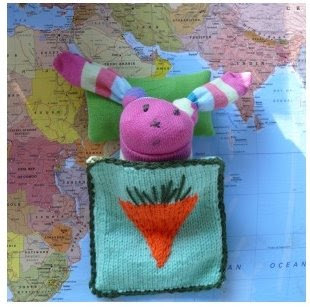 Oh my goodness - what a fantastic blanket - very jealous of global bunny going travelling. 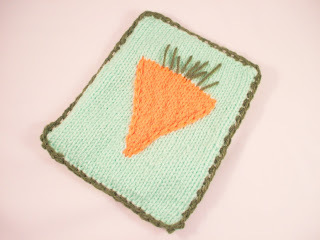 Won't your meerkats be jealous that bunny has such a fab blanket? How cute! I can't wait to hear about Bunny's adventures. That blanket is too perfect!